This past week we went on a vacation and enjoyed a super fun family reunion! I always feel so blessed when it comes to family...It is too bad we can't all live close together! 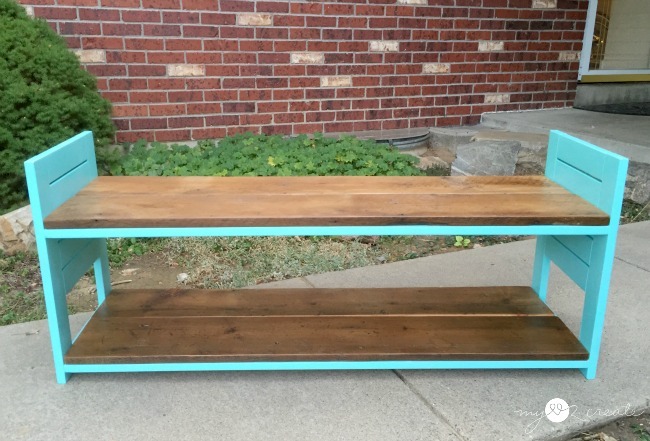 Speaking of family, I am so excited to finally share this cute Children's Bench that I made for my littlest sister, who happens to have 4 adorable little girls, last fall! 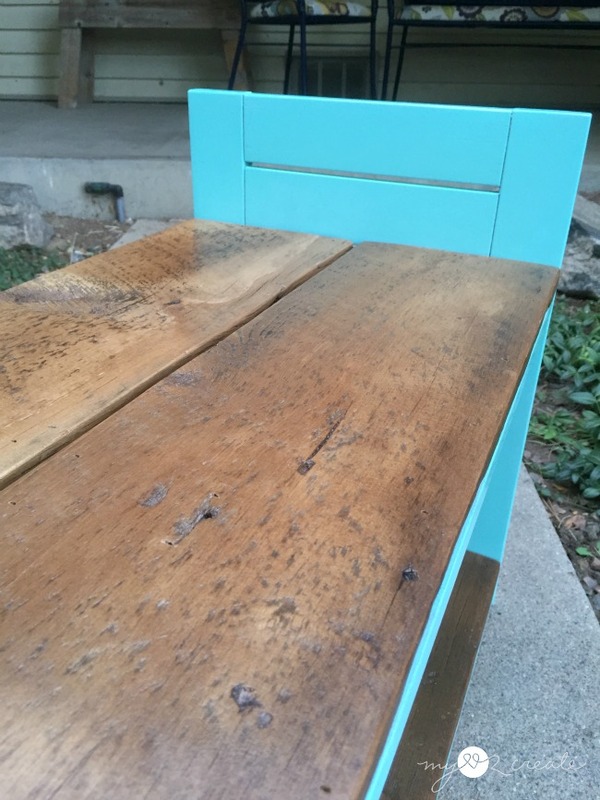 This project was first shared as one of my contributor posts for my good friend Gail at My Repurposed Life last October. I offered to make a project for my sister while she was here visiting with her family, and so we went outside for some inspiration. 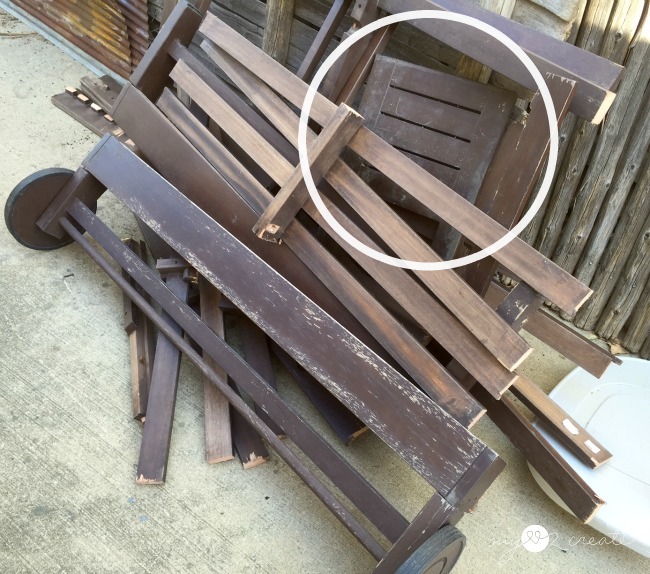 This pottery barn lounge chair was being trashed by my Father-in-law's neighbor. When he texted me this photo asking if I wanted it, I said, "Yes please." I got it home and of course it when on the side of my house in a big pile. When my sister mentioned she needed chairs for her kids table I first thought of the circled pieces above. 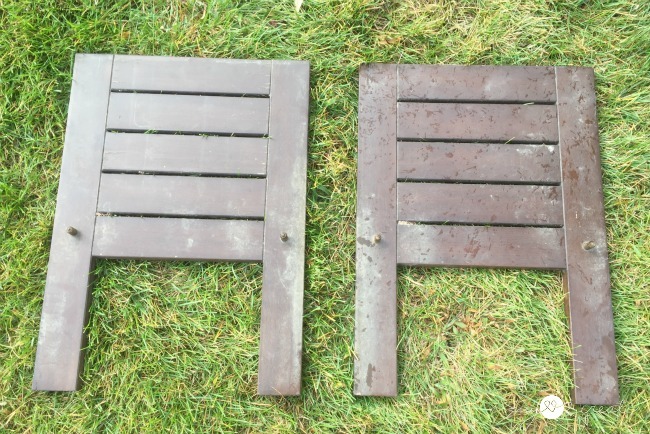 After measuring them I realized they were too wide to make chairs, so that idea was out. Then I realized they would be super cute as side supports for a bench...and benches are always useful especially benches with storage shelves, and it would solve her chair problem too! 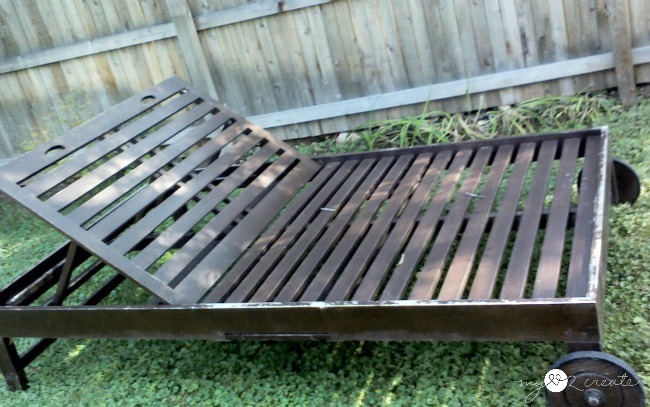 I started by cutting support boards from the lounge chair slats. I had to make sure the bench would fit in my sister's van for her trip back to Ohio, so we measured the van and I cut the slats at 45.5 inches each, so the bench would be 47 inches long. I used my Kreg K5 Pocket-Hole Jig to drill pocket holes into each end of my 1x3 boards. 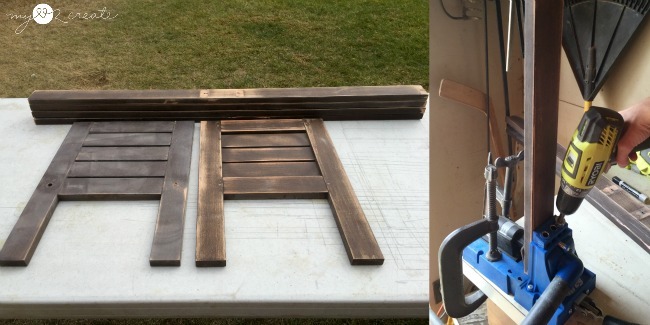 I want to show you how I measured where I wanted the support boards for the bench seat and shelf to be. I used my Combination Square ! I love this tool because it adjusts to where you need it and you can have it marked exactly the same on both sides. After attaching the second side to the support boards I was ready to cut some middle support pieces. I measured the length between the side supports for my middle supports I cut them to size and then drilled 3/4'' pocket holes and attached them to the long side supports with wood glue and 1 1/4'' pocket hole screws. 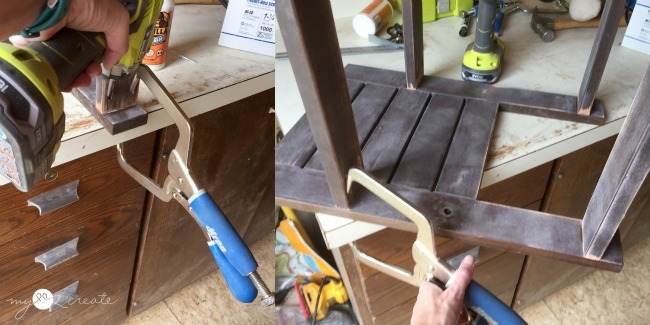 You can see I turned the bench upside down to attach them, but it could be done right side up too, since your seat and shelf boards will cover up the pocket holes anyway. 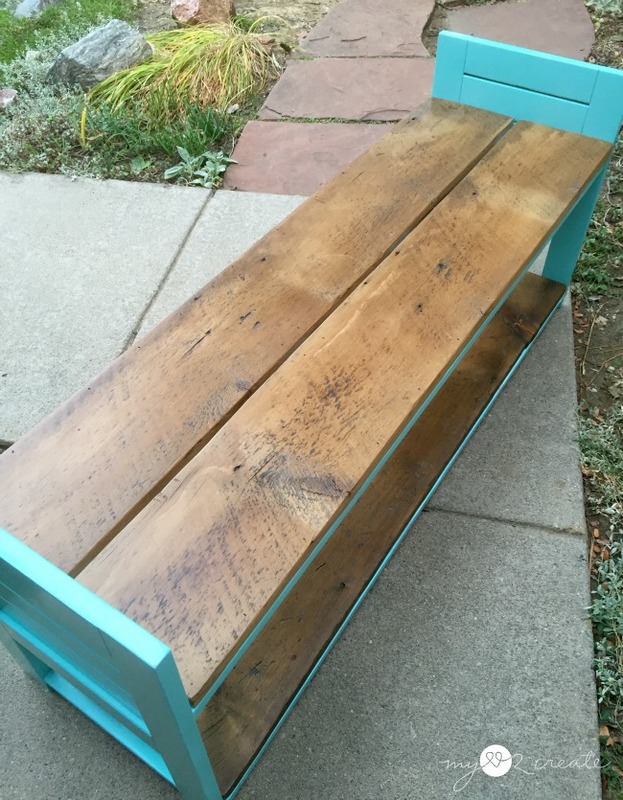 I had planned on using slats from the lounge chair as the bench seat and shelf, but my sister and I really wanted the seat and shelf to be wood and the rest of the bench a color. 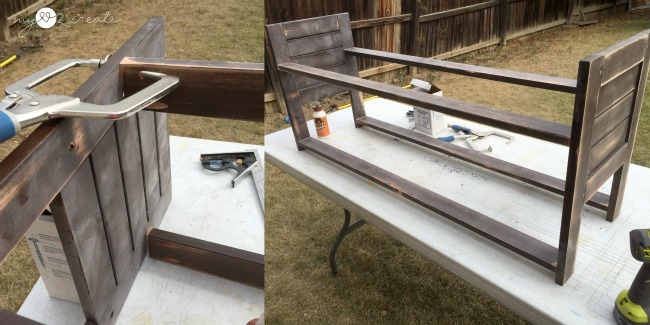 So it was easier to just use some reclaimed wood. 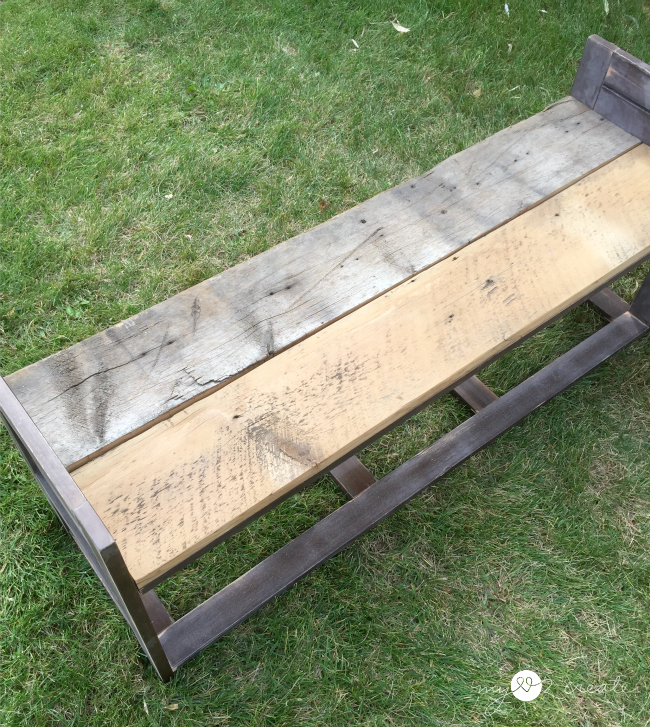 I was able to used some of my 70 year old barn wood... after some figuring... I cut each board into two pieces, to the right length, and then I used my Kreg Rip-Cut and my Ryobi Circular Saw (my favorite tool combo) to rip them into 7 inch wide boards. The bench is just over 14 inches deep so the boards fit perfectly! Yippee! Above I am dry fitting them and I sanded the front board, but not the back, it is amazing the difference in color! 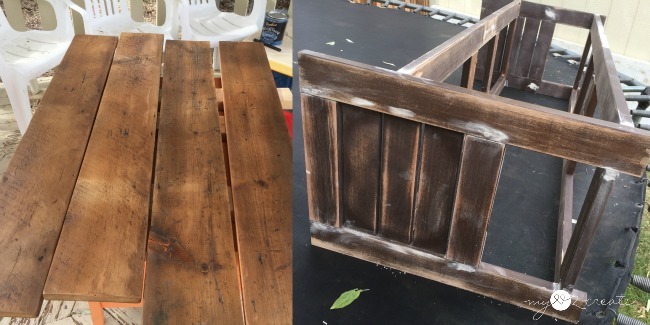 I had my sister give the the sanded and cleaned barn wood boards 2 coats of poly (normally I do 3 coats, but we were out of time). She is an awesome helper, and I know this because she was there when I did my other sister's closet/laundry room makeover. While she did the poly I filled in the holes on the bench with spackle, when it dried I sanded it down and wiped it clean for painting. 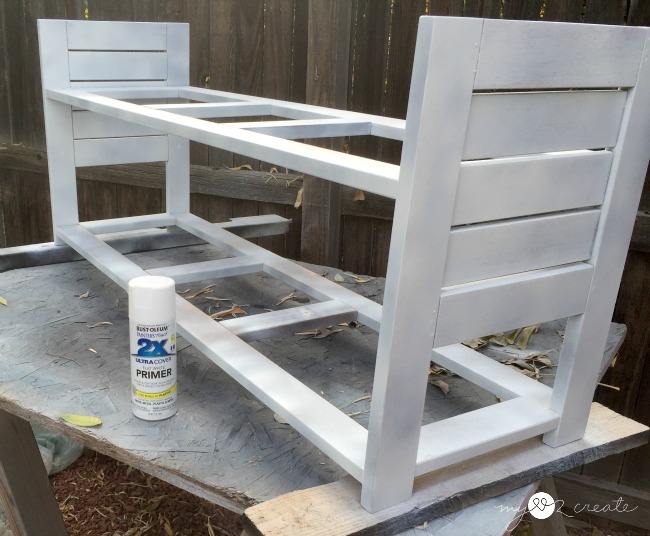 Since this is a children's bench, and it was so small, I only used two cans of spray paint. The final cost was just under $8 for the whole thing, just two cans of paint. 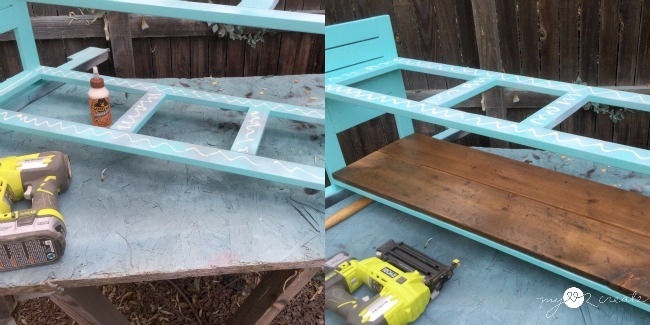 I used one can for priming, and then one for the color, which my sister picked, Rustoleum's protective enamel in gloss light turquoise. Love. Once everything was dry...or almost dry, did I mention we were in a hurry?...I glued and nailed on the reclaimed wood boards with my Ryobi Nail Gun , and it was finished! How stinking cute is this for my sweet little nieces?! And look at that storage shelf on the bottom! 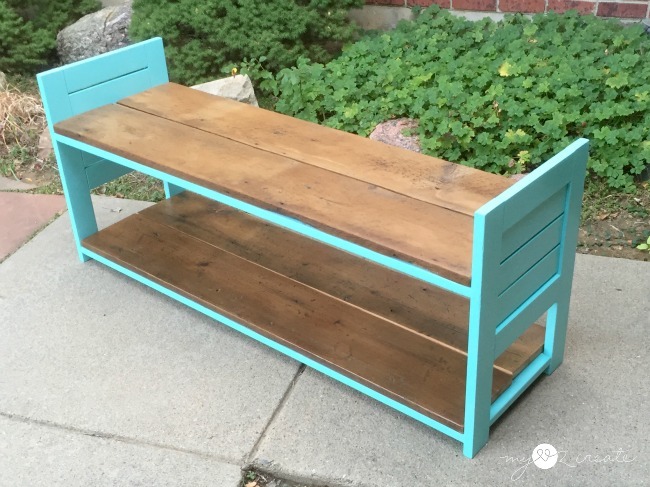 I had no idea that old lounge chair would contribute to such a cute little bench! I love it when I get to create out of necessity! And to do it for almost free... It makes me Giddy I tell ya! 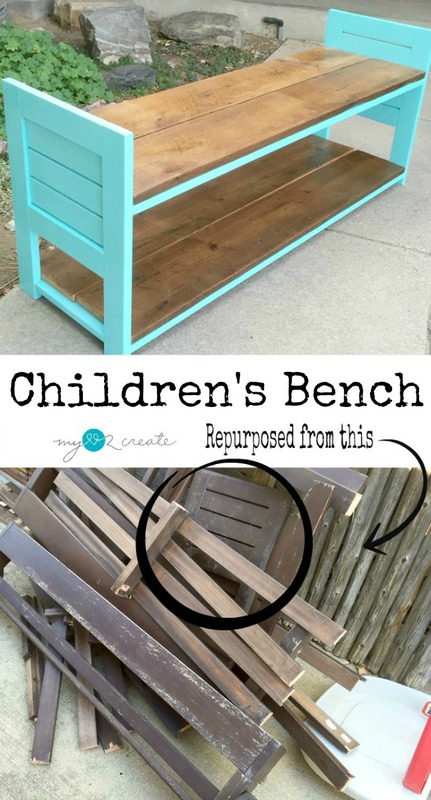 So have you repurposed anything lately! I would love to hear about it! 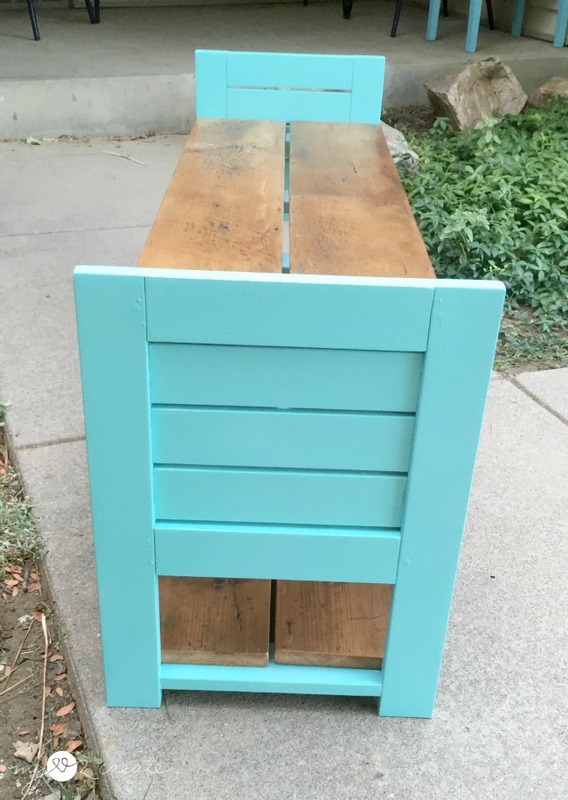 This is so great, what a wonderful upcycle. And I so appreciate the thorough tutorial! 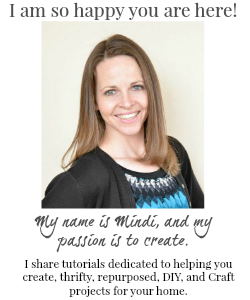 Thanks for linking up to the Talk of the Town link party! Adorable! The color is perfect. Great renovation. Thanks for sharing this step by step process. 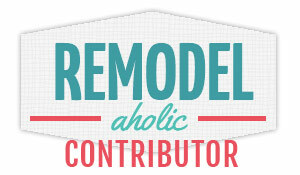 That's so inspiring for every DIY lovers.